I will be the first to admit that I do not have the ideal situation for my horses. It is a small property with a rickety old-style perimeter fence. I have heard from many, online, who say that people like me should not keep horses. In their view, if you cannot offer them at least dozens of acres of rolling pasture, with year round grass, then perhaps you just should not keep horses. I find that a sad view, when so many rescues are continually filled with horses who needed homes, and trucks still take others across the border to slaughter. 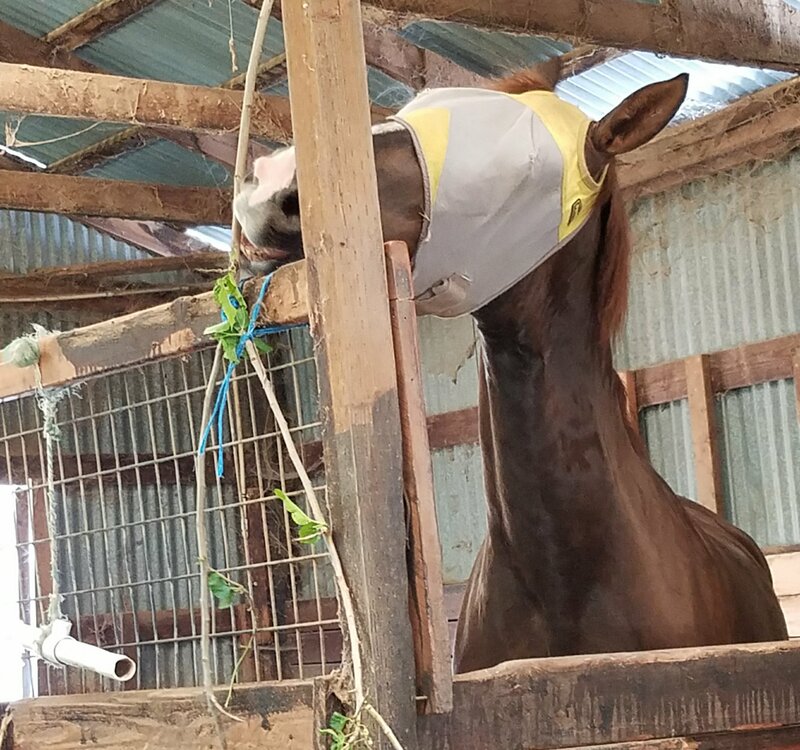 There are many ways to keep horses healthy and happy when you have less than ideal facilities. One of them is as simple as repurposing your prunings! I do not remember where the inspiration came from, but a few years ago I started hanging branches in my horses’ stalls. The response was amazing! To a horse, they found this fascinating. At that time, Tally was still a little alarmed at new things, so it took her a little time to approach the bundle hanging on her wall, the very first time. But even she had some fun playing with it. The prime times are usually spring and fall pruning season, but I try to find some branches throughout the summer. With all of the trees that we’ve planted, it’s not usually too hard to find something. However, this year I have been distracted by work and projects and have been slow to provide branches. Well, today was finally the day that I got around to it – and was it ever popular! A piece torn off and soon to disappear! The first thing they go for is always the leaves. 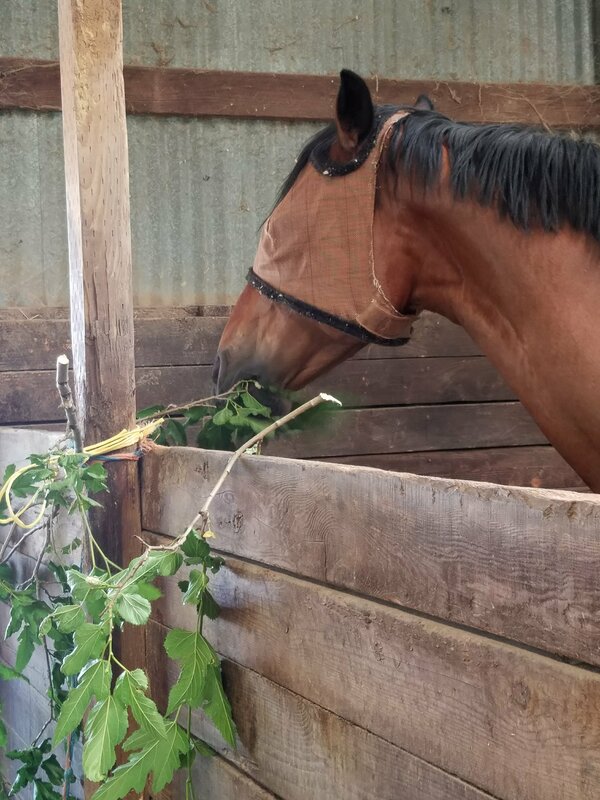 We always talk of horses being grazers, but horses will browse (eat trees and shrubs) as much, when given the opportunity. In fact, Coffee always goes for trees and shrubs over grass! Providing them branches with leaves adds natural variety to their diet. Today’s offering came from a fruited mulberry tree, so they got the bonus of the berries – Nash was not a fan of those. Of course, knowing that they will be dining on the leaves means you have to be careful about what branches you offer. There are a lot of resources online that can help guide as to what plants to avoid. The ASPCA offers an extensive list of plants toxic to horses, and I found this list of safe trees for horses (short, but a good place to start). Tried and true for my horses have been poplar, mulberry, apple, and rose. 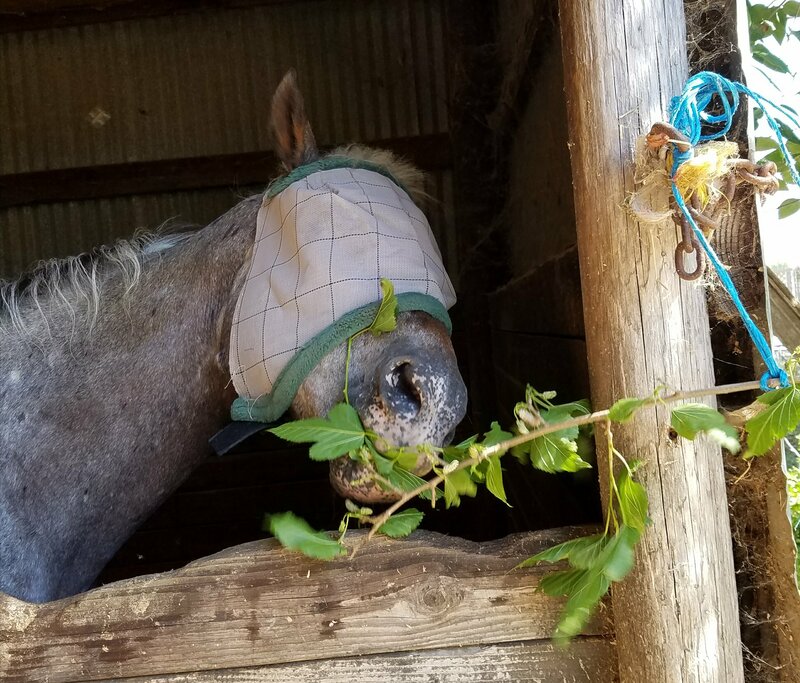 Many fruit and nut trees are actually dangerous to horses, but apple is an exception (being actually in the rose family … and anyone can eat a rose!). Pear should be equally safe, also from the same general family – but I have not yet found confirmation of that, so holding off for now. 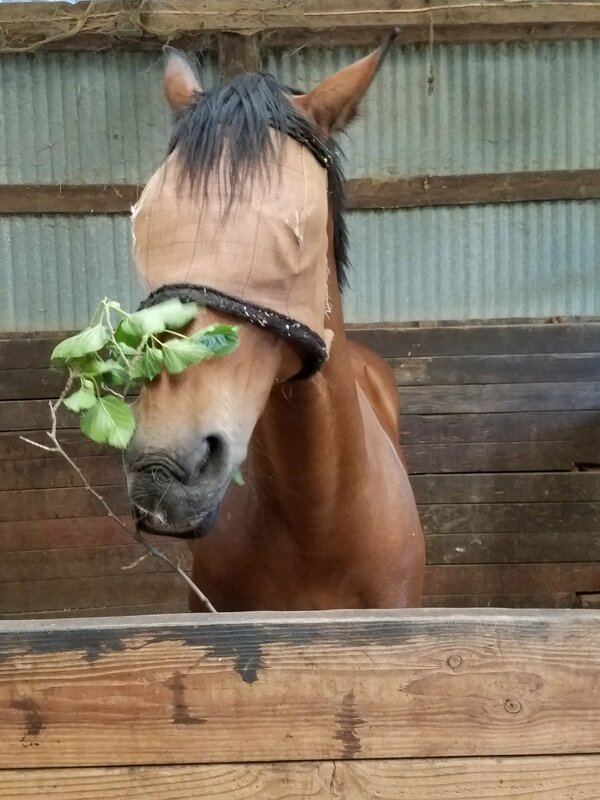 The horses love munching the leaves, but the fun doesn’t end there. Stripping and eating bark is also very popular – and they are surprisingly good at it! I am used to goats stripping bark – but they have a lower row of incisors (no uppers) that are sharp and shaped for the job of stripping shrubs and trees. 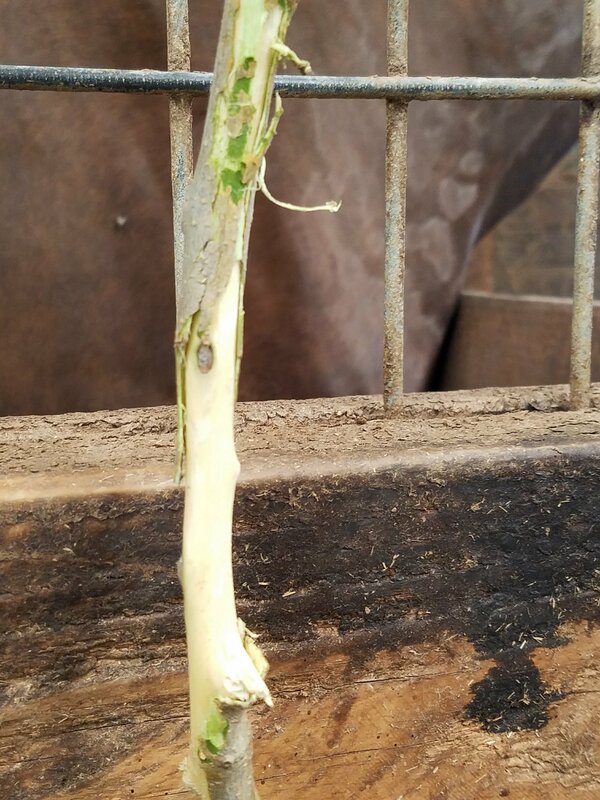 But the rather square set of incisors horses are equipped with seem less suited to stripping bark from small branches – yet they are very good at it! Noble getting some neck stretching in. Even beyond consumption, branches offer amusement. Tugging, swinging, even throwing them over the partition to the other horse (yes, Noble and Coffee do that) have all been amusements involving branches. Aside from mental stimulation, which is great, it helps them replicate natural movements horses would experience in the wild. Even Nash was quick to enjoy! I would love to offer my horses their own special Eden – but as humans we cannot even say what that would be! Many seem to think they know, and they base that upon the lives of wild horses. But do we still live as our ancestors did? And isn’t it by choice that we have houses, beds, etc.? Noble has free access to the back, and takes full advantage; however, in inclement weather (heat, wind, rain) he will simply poke his head out, then return to the comfort of his stall. So, stall life is not the horror to horses that people try to say – provided they have light, interaction, and opportunities for amusement. 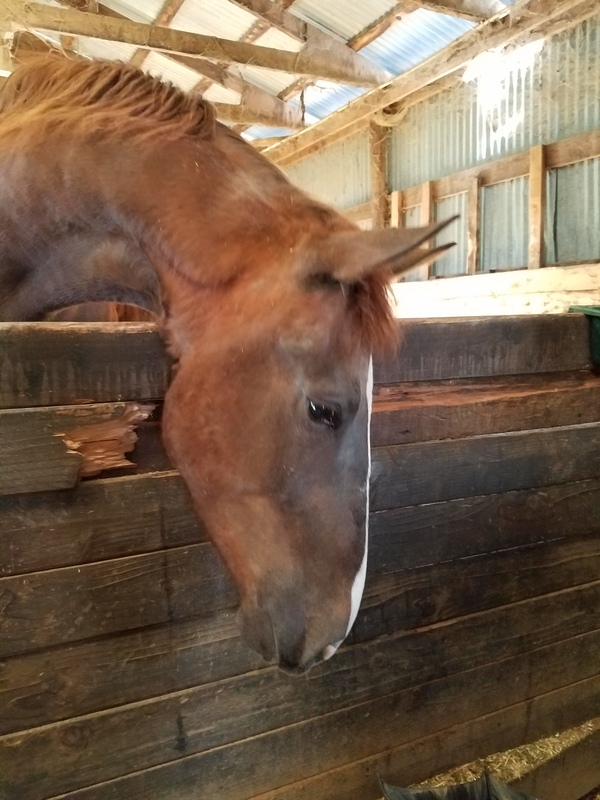 So, if you are like me and your horses spend time in stalls, no need to feel guilt. But try adding some horse-safe branches and see what happens! This entry was posted in My Journey and tagged amusement, Coffee, enrichment, horsekeeping, Nash, Noble, nutrition, Roxie, Tally. Bookmark the permalink.